Often times neglected in K-12 education and the home, teaching these critical skills not only benefits young adult patrons, but also parents, employers, and communities. YALSA’s The Future of Library Services for and with Teens: A Call to Action highlights a recent concern that young adults are lacking “an expanded set of skills that goes beyond traditional academic skills” (2014, p. 3). Alongside growing demands for problem solving, critical thinking, and media and digital literacies, youth need financial literacy, civil and social literacy, and task-based literacy (PA Forward, n.d.; White & McCloskey, 2004). Just to name a few. 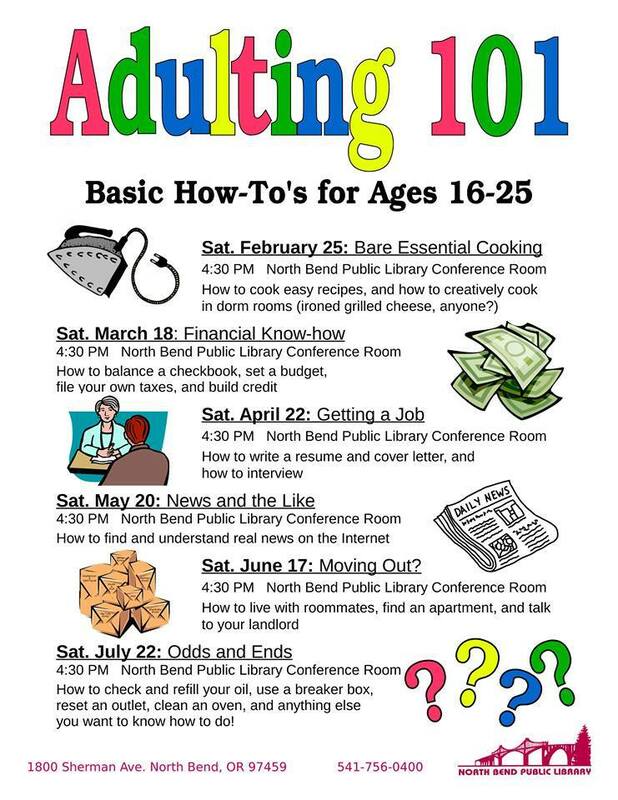 On Programming Librarian, North Bend Public Library in North Bend, Oregon provide detailed information about their successful “Adult 101” program, which helps teens and college students learn essential skills that are necessary when seeking employment, housing, and utility services. The Los Angeles Public Library, with partial funding from the Institute of Library and Museum Services (IMLS), offered Adult 101 teen programs on managing finances, getting and keeping a job, and nutrition and fitness. A new but related find for me is partnerships developing between public and university libraries to sponsor adult life skills programming. The Emporia Public Library and the ESU William Allen White Library hosted a series of workshops that brought in presentations and meet and greats from community leaders, and engaging activities on finances, managing stress, and experiencing living away from home for the first time. As public and university libraries combine strengths and resources, they reach and embolden even more youth who come from diverse backgrounds and with diverse needs. Older teens and new adults are using their local libraries especially online but are often unaware of other library services available to them (Pew Research Center, 2014). Creating relevant and helpful programming is one step towards getting the 18-20 year olds into public libraries and encouraging lifelong library supporters. There are so many other terrific examples, a few of which I’ve included in the references and resources section below. I would encourage curious teen librarians and library staff to contact those who have run these programs and found success (or even missteps). While “adulting” may not sound as valuable as SAT studying or traditional college prep, these are the vital skills that promote teen development into healthy, thriving, and thoughtful adults. Braun, L., Hartman, M. L., Hughes-Hassell, S., Kumasi, K., & Yoke, B. (2014). The Future of Library Services for and with Teens: A Call to Action. Chicago, IL: Young Adults Library Services Association. Tagged adulting, Life Skills, public libraries, Teen Programming, university libraries, youth services.